Vitamin K is an important fat-soluble nutrient for your body. 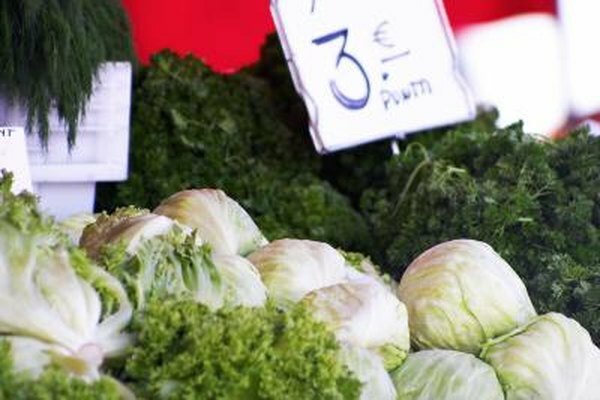 Jonny Bowden, Ph.D. and Clinical Nutrition Specialist, explains in his book "The 150 Healthiest Foods on Earth," that vitamin K is essential for your bone health because it aids in calcium and magnesium absorption. A vitamin K deficiency can increase your risk for osteoporosis. If you have osteoporosis or a family history of it, you should become familiar with the fruits and vegetables that have high levels of vitamin K and make them a part of your diet. Green leafy vegetables are the dietary sources that have the most vitamin K.
Kale one of the most potent sources of vitamin K. One cup of kale has 1054 micrograms of vitamin K -- more than any other vegetable at the same serving size. This is an enormous amount of vitamin K considering that the USDA guidelines suggest that males get 120 micrograms and female get 90 micrograms of vitamin K daily. A single serving of kale provides 9 to 10 times your recommended daily dietary intake of this vitamin. Bowden lists kale among the very best green vegetables you can eat. Kale is an abundant source of cancer preventing phytochemcials and antioxidants, as well. Following kale, parsley has the highest amount of vitamin K per serving. One cup of raw parsley has 984 micrograms, or about 8 or 9 times more than your recommended daily intake. Parsley is also among the "150 Healthiest Foods on Earth" and is a good source of myristica, a volatile oil that may inhibit tumors according to Bowden and the National Institute on Cancer. Additionally, parsley is a rich source of beta-carotene, vitamin A, lutein and zeaxanthin, which help support your vision. Most people only think of parsley as a condiment, but parsley sprigs are very healthful and you can wash and then eat them just like any other vegetable. One cup of cooked spinach provides 884 micrograms of vitamin K and is only 7 calories. Bowden notes that "calorie-for-calorie" green leafy vegetables like spinach provide more vitamins, minerals and nutrients than any other foods on planet. Make sure to cook your spinach for maximum vitamin K potential though. Raw uncooked spinach has 145 micrograms of vitamin K, still meeting and slightly exceeding your daily recommended intake, but cooked spinach has about 8 times more vitamin K.
The best fruit sources of vitamin K are blueberries and grapes. Most fruits, with the exception of blueberries and grapes, have very little vitamin K. Citrus fruits, such as oranges and grapefruit, have less than 1 microgram. One cup of blueberries has 28 micrograms and 1 cup of grapes has 23 micrograms of vitamin K. Other green vegetables, such as Brussels sprouts, collard greens, green onions, Swiss chard and turnips, all have significantly more vitamin K than these two fruits.